South Florida's large palm trees - whether majestic and stately or slim and elegant - make an impressive, and often formal, statement in a home landscape. 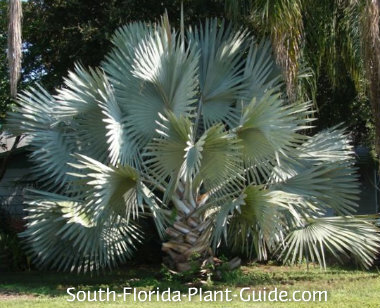 Growing to a mature stature of more than 20 feet tall, large South Florida palm trees can be massive or just tall and willowy, and combinations of them with each other and with smaller palms, as well as with shrubs and flowers, gives each landscape a unique tropical look. 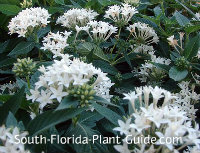 Choose one that thrives in your planting zone - the Plant Pages will tell you which are cold-hardy palms, best for cooler areas of South Florida. Smaller spaces - pick one with a visible trunk, rather than a palm that stays low and wide for years. 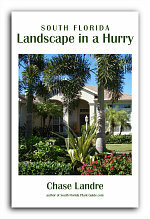 Consider not only how tall but how wide a palm will fit in the area you have - fronds need elbow room to grow. Plants are classified as fast, moderate or slow growing - for more "instant gratification" buy a faster growing palm or a bigger specimen for slow growers. Some palms drop fruits - use these varieties in areas where you won't be walking. 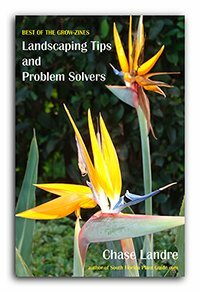 Palm trunks can be a decorative landscape element - find out in the Plant Pages what kind of trunk a palm will have...important to know for care and because, especially with large palm trees, you'll be seeing a lot of it. Never cut off the trunk of a palm - you'll kill it. Only clustering palms that grow multiple shoots can be trimmed, cutting each unwanted trunk off at ground level. Remove browned fronds but try to let them go about 3/4 brown because they are feeding the emerging new frond. Some palm varieties are self-cleaning, meaning when a frond is dead it'll fall off on its own. Other types of palms retain the dried fronds as a "petticoat" under the green fronds. These can be cut off - while you can reach them - but once a large palm is, well, large, you'll want to hire a pro to trim...or just leave the petticoat in place. Old leaf bases can be left intact...some are extremely pretty and add to the unique good looks of a South Florida palm tree. Or remove by cutting them off (never rip them off) taking care not to damage the trunk beneath. Eventually most leaf bases will fall off anyway, starting around the base, and you'll see the trunk. Many palms, though solitary by nature, are grown in groups of multiple trunks. A double trunk palm can frame a house or garden focal point or a water view between its two trunks. Triple trunks are used to give more mass to the planting, and for a fuller canopy of fronds. The more trunks - the more room you'll need for fronds (when young) and space to walk around the trunks (when mature). 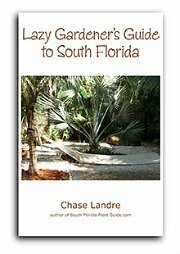 How to grow palm trees - including soil amendments for planting palms and when to apply palm fertilizer - will be covered in each of the Plant Pages. Some bigger palms, like the Ponytail Palm, are slow-growing and are actually grown as small landscape palms because they take a long time to grow large. But even if it takes quite a while, be prepared to live with the ultimate height of the palm you like.